Hi lovelies! 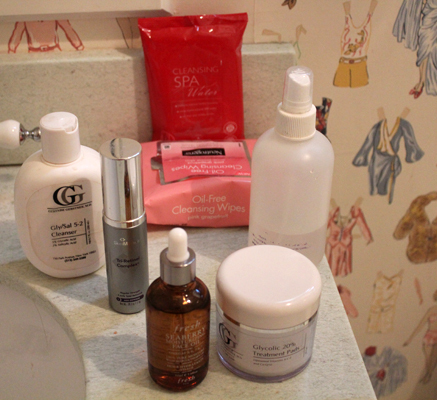 After sharing 2 of my favorite new skin care products, I thought I should write a post on my skin care routine! I have acne prone skin; since I was 11 years old I have been getting terrible breakouts, although my skin is a hundred times better than it was when I was a teenager (thank god). I have been to many dermatologists, and had an ongoing battle with acne. It really started slowing down when I started seeing Dr. Gerstner and Dr. Kassimir in NYC. Both of these Dr.’s are amazing, and 2 of the best in New York. Although I follow my dermatologist’s regiment, I have altered it in a way that works best for me! I start by removing my eye makeup with Koh Gen Do Cleansing Spa Water Cloths, and then removing my face makeup with my Oil-Free Cleansing Wipes by Neutrogena. (It may seem a bit obsessive to use cleansing wipes before washing my face with a cleanser, but I wear a decent amount of makeup and it’s really important that all of it gets cleaned off to avoid clogged pores!) Following that, using my Dynamic Duo Face Brush (which I reviewed in my post “Two of my Favorite New Skin Care Products!“), I wash my face with a cleanser from my dermatologist, which is a Gly/Sal 5-2 Cleanser. This cleanser at skincarerx.com contains the same ingredients. I also apply Aquaphor healing ointment to my eyes almost every night unless they do not look dry. Now, here is where it gets a little annoying. Every 3 nights I alternate between products. On day 1– I use my Glycolic 20% Treatment Pads, which are from my dermatologist, but EssentialDermCare.com has this product with the same ingredients. I apply a pad and after 30-60 seconds I rinse it off. These Glycolic pads are great because they remove dirt from the surface of the skin so they keep your pores nice and clean! After, I apply 2-3 drops of iS Clinical Pro-Heal Serum to my face and neck. On day 2- after washing my face I apply Tri-Retinol Complex from SkinMedica. On day 3- after washing my face I apply Fresh Seaberry Moisturizing Face Oil, and then spray my face with Sea Water from Susan Ciminelli. This product hydrates the skin and allows the face oil to saturate. Well you would never know that you have troubled skin. It glows now! all that over again. Anyhow, just wanted to say excellent blog!